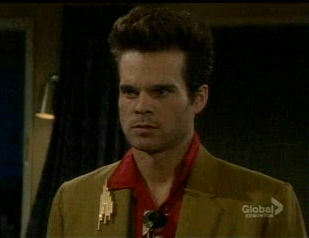 The Y&R Update Friday 10/29/10--Canada; Monday 11/1/10--U.S.A.
Daniel and Abby walk into his home, and find a pregnant Daisy waiting for him. Abby is shocked to see her, and to see that she's carrying a child. Daisy tells Daniel that it's his. He starts to say that he never slept with her, but she corrects him and says that they did; once, and that's all it took. Daniel tells Abby that Daisy drugged him to stop him from rescuing Phyllis while her aunt went to kill her. He says that she made it look like the slept together in order to trick Amber. Daisy says that she did drug him, but the drugs lowered his inhibitions, and he came on to her. Daniel says he was passed out, but Daisy says that's not true. She says he's the only man she's ever been with. Abby calls her a liar. Daisy says life has been hard for her on the run, and she hasn't been getting enough sleep or the right food. She says the baby is Daniel's responsibility and that she and her baby need someone to take care of them. Abby tells her that the cops will be happy to house and feed her. Daniel likes the idea and says he'll call them. Daisy pleads with Daniel not to turn her in, and asks if he wants his baby to be born in jail. Daniel's adamant that it's not his child, and says that the state will take the baby from her anyway. Daisy offers to get a DNA test done on the baby, and Abby suggests that she's trying to scam Daniel for money. Daisy then threatens to hurt the baby if he turns her in, saying she has nothing to lose. Daisy thinks Daniel knows the baby is his, and that's why he stopped calling, but he says he doesn't want her to do anything crazy. Abby uses her phone to call the police without anyone noticing. Phyllis, Michael and Lauren go to the police station and tell Ronan about seeing Daisy at Billy's party, and show him a picture. Ronan says she had a lot of time to get away, and Michael says that it's important that they find her because she's a psychopath. He tells Ronan that if Daisy's plan had worked out, he Lauren and Phyllis would be dead. Ronan notices that Daisy looks pregnant, but Phyllis is sure it was part of her costume. Ronan and some other officers go to check out Jimmy's for evidence, and Michael goes with him. Michael has Lauren and Phyllis stay at the station, as it's the safest place. Lauren notices a stack of 'Wanted' posters with Daisy's picture on it, and has a flashback to Sarah holding a gun on her. She panics and runs out of the station, with Phyllis running after her. At Jimmy's Kevin tells Jana that Daisy was in the background of a picture Phyllis took. Jana starts to panic. Kevin wonders if Daisy is alone, or if Ryder is back again as well. This makes Jana defensive, and she says she hasn't been in contact with him. Noah assures her that Daisy will be caught, and suggests taking her home. Jana doesn't want to go because she's sure Daisy will get to her anywhere. Kevin tells Jana that she won't be alone, and she looks hopeful, until he says that Noah will stay with her. Jana points out that Kevin is in danger too, and he says he's going to join the search party. Jana grabs onto him, and tells him she's scared, but Kevin says that this is the best way to protect her, and everyone else. Victor comes home, and chats with Meggie. She pours him a drink, and they sit down together. Meggie mentions that she's making him a meal that he mentioned liking in an interview years ago. She searched the internet to find out his preferences. She asks about Nikki, and Victor says he didn't get a chance to see her before visiting hours ended. Meggie gets up, and says she made up a care package for Nikki, and is going to go to Solidarity House and leave it at the desk. She looks into the bag before she walks out the door, and it's shown that it contains a smaller bag full of mini bottles of liquor. Nikki exits her room at Solidarity House, and finds Deacon in the hall, looking under a couch. He tells her he misplaced his thirty day chip. He then finds it in his pocket, and asks how she's doing. She says she's craving a drink. Nikki talks about the damage she's done to all her relationships, and says that Victoria hasn't visited. Deacon asks if she's [Victoria's] upset with her, and Nikki says she doesn't know. Deacon tells Nikki that if they weren't in rehab, he'd offer her a drink. Nikki says she'd take it, and that's why she's there. A worker tells the two of them that it's 'lights out' soon. Deacon tells Nikki things will get better. Nikki says it can't get any worse. Deacon smiles, then goes to his room. As Nikki is going to her room, Meggie walks up, and calls out to her. She gives her the care package of books and things from Nikki's home. Nikki is glad to get it, and goes back into her room. Meggie then places the smaller bag under the couch, and leaves. Deacon goes back to the couch, and finds the bag. Deacon goes to Nikki's room, saying he knows she doesn't want him around, but he thought she might want some company on a night where she's struggling. He has a deck of cards with him. She hesitates, but lets him in. They play cards, and Deacon pulls out the bag Meggie left behind. He tells Nikki he found it, and if she wins, he'll give it to her. She asks what's inside, but he doesn't say. Nikki thanks him for helping her pass the time, and for not being judgmental. She says he could blame her for helping him relapse, but isn't, and she's grateful, and thinks he's shown a lot of character. Deacon looks nervous, then says that he brought himself down, not her. Nikki says she drags herself down, too, and is going to follow his example of taking responsibility for that. Nikki wins, and Deacon goes to give her the bag, but Nikki grabs his hand and tells him to wait. She says that they need to make another pact. Nikki says that the two of them got there on their own, but will get out together. Deacon agrees. Nikki asks for the bag. Deacon hesitates, then tells her he has someplace to be, and takes the bag, and starts to leave. He opens the door and runs into an employee who tells him he's supposed to be in his own room. Deacon gives the lady the bag, and says he brought it in, and asks her to get rid of it. The woman pulls out one of the bottles of alcohol, and commends Deacon for doing the right thing. Nikki is shocked. Deacon tells her that he's done some bad things, but that's not who he is. Nikki says she doesnt know if she'd have the strength to do what he did. Deacon tells her that it's thanks to her. He says her talk reminded him of a time when he was doing well, and had someone who cared, but he doesn't think that woman would recognize him now. Nikki says that the person he's talking about would be proud of him tonight. They stare at each other, as if there's some attraction there, and Deacon decides it's time to leave. Katherine and Victor visit Murphy, who's sleeping. He's been trying to communicate with Kay, but she thinks she's been asking him the wrong questions because he gets agitated, and his blood pressure sky-rockets. Victor says it must be hard on the two of them, but Kay says she's fine. She just hates not being able to help her husband. Victor tells Kay that Nikki has been drinking again, lied about it, and that he checked her into rehab for thirty days. Kay tells him that he did the right thing, and that Nikki will be grateful for his support. Victor says she'll always have that. Kay asks if he still wants to marry Nikki. Victor says he's not sure anymore. Kay takes a call from Mac, who's doing fine and just wanted to check in. Kay then asks Victor if he means what he's saying, because just a few days ago, they all talked about what a good fit he and Nikki were. Victor says Nikki has been lying. Kay asks if he understands that lying is part of the shame and denial that alcoholics feel. 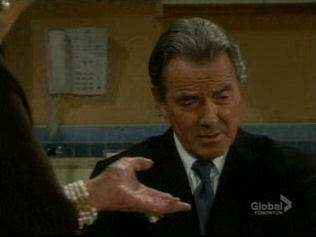 Victor tells a shocked Kay about finding Nikki in a hotel bed with Deacon. Victor says he doesnt think anything happened between them, but doesn't know what her sinking to this level would mean their marriage would be like. Kay says Nikki has been through a lot, and Victor agrees. He talks about the fight between him and Victoria taking a toll on her, and then wonders if it's his fault that Nikki is in this state. He wonders if he's not good for her, and says that Nikki made sure that they didn't get married. Kay says that he's proven that he's good for Nikki, and that Nikki wasn't trying to make a point by getting drunk and passing out in bed with Deacon. Victor says it will be hard to get over seeing Nikki in bed with Deacon, but Kay says the two of them have been through worse, and he has to have faith in what they have. She tells Victor that he belongs with Nikki. Murphy wakes up, and Victor and Kay go over to him. Kay reminds Victor to take care of himself, and Victor says that Meggie is helping him out at home. Murphy begins blinking rapidly, and tapping one finger. Victor tells Murphy that he heard he'd regained some control in his hands. Kay tells Murphy that she doesn't know what he wants to say to her, but won't give up until she finds out. Kay tells Victor that Murphy is trying to communicate with him, and tells him not to give up. Victor says he won't, and asks Murphy if he agrees. Murphy does. Victor goes home and Meggie is waiting with a tray of food. She finds out he was with Murphy, and asks how he is. Victor tells her that he still can't communicate. Meggie says she wishes she could have helped Murphy and Nikki. Victor says that he knew Meggie was a kind person when he met her. He takes her hand, and strokes it. Meggie thanks him, and gives him a hug, and kiss on the cheek. She then leaves. In the hallway, she quietly says she'll almost miss Victor when he's gone. Noah and Jana go to her apartment, and she checks all the locks, and talks about Daisy. She says Daisy might not be targeting her, unless she and Ryder are working together again. Jana says that if Ryder is mad at her, the two of them might come after her. Noah offers to stay with her. Jana says she wants him to. Michael and Kevin are at Jimmy's, waiting for Ronan to finish searching the alley, when Ronan walks in carrying Daisy's costume. He says that the costume has a label of the shop where it was bought, and he leaves to go search that area. Kevin asks about Lauren, and Michael says that the Halloween party was similar to the masquerade ball where she was kidnapped, and he doesn't think it was a coincidence. Kevin says that Daisy had better hope the cops find her before the two of them do. Michael and Kevin go to Crimson Lights after checking out the old amusement park where Daisy held Lauren captive, and finding no sign of her or Ryder. Kevin says that Ryder used to live on the streets, and they could be doing that now. Ronan texts Michael about a lead at a hotel. The clerk said Daisy was sweet and may be pregnant. He and Kevin decide to go to the hotel. At the hotel, Kevin, Michael and Ronan look through Daisy's room and find her belongings, including a sonogram and prenatal vitamins. Ronan tells them to put everything back like they find it so they can capture Daisy when she comes back. Michael isn't sure she'll be back. Kevin points out that Jana lives in the area, and decides to check on her. Noah is in Jana's living room, stripping down to his boxers when she comes in with a blanket and pillows to make up the couch for him. He apologizes, saying he thought she was sleeping, and she jokes that he's making himself at home. He covers himself with the blanket, and Jana assures him that she's not a prude. He asks to hear about her crazy past, but she says it doesn't matter, because she's not that person anymore, and is timid now. Noah offers to go to his car and watch her place from there, but Jana tells him she'd like him to stay. Noah takes that as a signal, and begins to kiss her. While Noah is kissing her neck, Jana notices a text from Kevin saying he's on his way to her home. She quickly stops Noah and tells him to leave. He's confused and starts to apologize, but Jana rushes him out. Noah stands outside Jana's apartment, debating on whether to knock on the door, when he looks in her window and sees her trashing the room. Kevin arrives at Jana's and she tells him that Daisy was there, and left when she screamed. She lies and says Noah dropped her off. He starts to call Ronan, but gets his voice mail. Jana asks Kevin to stay with her, and he agrees. Kevin decides to let Chloe know he's not coming home, and Jana sends him into the bedroom for privacy. Noah knocks on the door, and Jana steps outside with him, and tries to get him to leave. He says he started home, but came back because he had to know why she was throwing things around the room. She accuses him of spying, but he says he heard a crash, and was concerned. Jana says that the way she deals with stress is none of his business, and tells him to go. Noah leaves. Jana goes back inside. Kevin notices she was gone, but she covers about checking because she heard a noise. Jana offers Kevin the bed to sleep in, but he says he'll stay on the couch. Jana lingers, but Kevin firmly says goodnight. Jana goes to her room. Phyllis is at Lauren's home trying to comfort her. Lauren has just check on Fen. He's fine and at a friend's house. Phyllis tells Lauren that she's safe. Lauren says she thought she was safe before, but Daisy was in the same building. Phyllis says that Daisy wasn't violent, and that Sarah was the more dangerous one, but Lauren says Daisy was more evil than Sarah. She starts to have a panic attack and begins to hyperventilate. Phyllis tries to help her calm down. Michael is in Daisy's room, when he gets a call from Phyllis telling him that Lauren is overwhelmed and needs him. He then gets a text from someone telling him that Daisy is at Daniel's apartment. Michael comes rushing home excitedly telling Lauren and Phyllis that Daisy has been found. Lauren is extremely stressed out, and says that this could all be part of Daisy's plan, and that Ryder is still out there. Michael tries to calm her down, but she tells him that they aren't safe, and never will be. Daisy starts to leave Daniel's apartment, after telling him to set up things for the DNA test. Daniel and Abby stall her, asking about the test, and about Ryder. Daisy says that she doesn't know where Ryder is, and mentions that Abby used to have a crush on him. Ronan arrives, and arrests Daisy, thanking Abby for the tip. Daniel tells Ronan that Daisy threatened the baby, and Daisy says Daniel is worried because the baby is his. Ronan takes her away. Abby starts packing her things, and Daniel asks her to stay. She says she's tired, and Daniel assures her that he's not the father of the baby. Abby says she knows. She kisses him goodnight, and leaves.